In the time of the Roman Empire, grapevine varieties assumed such great importance that many of the indigenous varieties were brought to the colonies or later imported. Wine motifs from this time are abundant (Figs. 18‑24). There are also documents on processing techniques from this time (Fig. 17). According to Johnson (1999: 69), “Awareness of grapevine varieties was already pronounced in the first century AD, just as it is today amongst vintners in California or Australia.” The best wines were those from the Greek varieties. 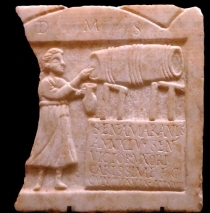 Amineum, the wine from Aminaea (of which there were five varieties) was described by Pliny as being particularly full‑bodied and robust, with a high potential to mature, and having no parallel in terms of quality. One other variety, the “Nomenta” came close: this was an early frost‑resistant variety with a rosé strain, which was cultivated on the Tiberian hills North of Rome. Apart from these, grapevines which had received attention because of the high yield also came from Rome’s overseas provinces. The varieties Balisca (from Spain) and Biturica (from Bordeaux) showed promise, whilst Lucius Columella († AD 70) and a few contemporary writers advocated the quality of the frost‑resistant and productive varieties of Arcelaca and Argitis, or the Riesling (Johnson, 1999: 69). Johnson (1999: 73) goes on to mention the Greek Greco and Agliano varieties of Champagne (in Italy), and the Roman varieties Fiano, Alopecis (Coda di Volpe) and Pedirosso. After the Punic tribes were banished from Iberia in the second century BC, Roman influence began to dominate the Iberian Peninsula. The Peninsula was opened up to traffic with Roman roads, pegged systematically with milestones. These calzadas romanas provided a network which served regional trade in wine and other products. Next, the territory was divided into two provinces: Hispania Citerior (“Nearer Spain) and Hispania Ulterior (“Further Spain”), the former being South and West, and the latter being East, whilst the North, i. e. the stretch of land between the Pyrenees and Galicia, remained autonomous. 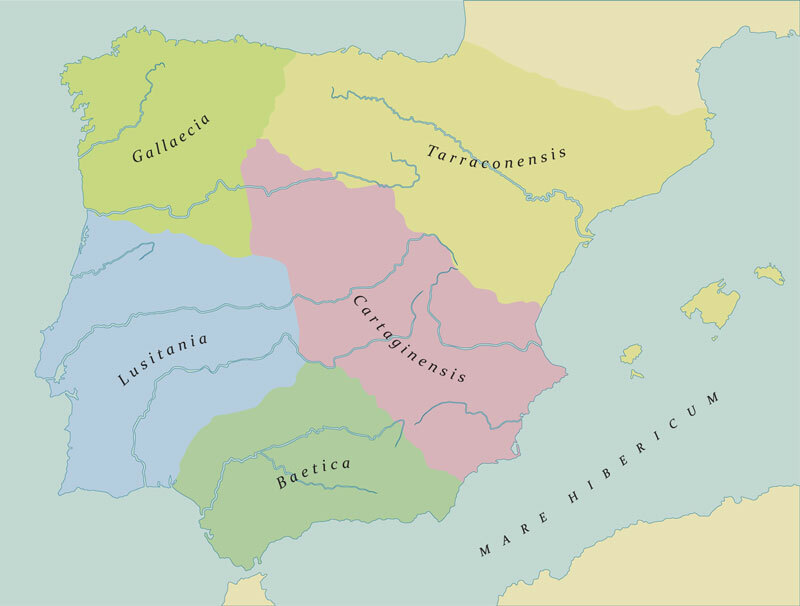 Under Caesar Augustus Hispania Citerior was renamed Hispania Tarraconensis in 27 BC and Hispania Ulterior was divided into the province of Lusitania and Baetica. In AD 289, under the Emperor Diocletian the territory was redivided. 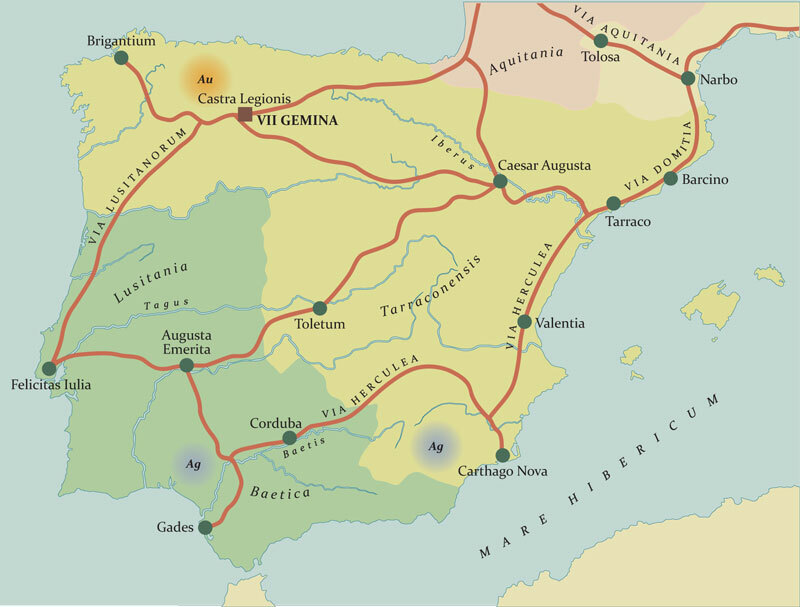 In AD 500 control of Hispania passed from the Romans to the Visigoths with whom the Romans had initially struck a federal alliance. Iberia was important to Rome because of its gold, silver and copper mines, as well as agricultural products such as olive oil, cereals, salt, ham, horses, slaves and wine. 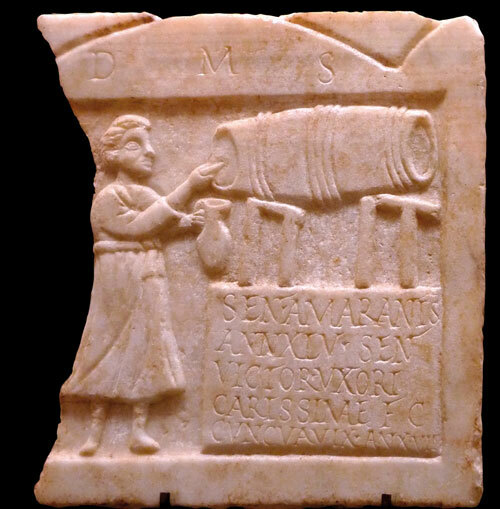 In addition to being an export, wine was a substantial part of the Roman soldier’s wage and therefore became extremely important in practical terms, and vineyards were cultivated almost everywhere. Roman viticulture and winery practice was very sophisticated and advanced, as can be gleaned from Pliny the Elder and other Roman writers. Many of the quality policies still valid in the vineyard today were already well‑ known. From the reading material it would appear that the selection of grapevine varieties best suited to climate and soil as well as the removal of diseased grapes were just as important as the commonly used procedures of cutting out excess fruit, caring for the foliage and, in exceptional cases, even destemming before pressing the grapes. The Romans were even familiar with quality improvement techniques such as the post‑harvest maturation of grapes on straw, the twisting off of the stems on the vine before harvest and the selection of the best clusters and berries. Maceration occurred gently using bare feet, and the must was pressed out using screw presses or stone weight presses. The quality of the wines depended largely on hygiene and temperature during processing – conditions which were often difficult to achieve. The Roman writer Pliny described cellar technology thus: “Big differences in the treatment methods could be observed in the wines that had been brought to the winery.” The rules of preparation at the time were obviously different for expensive wines, heavier sweet wine and wine for everyday needs. We do know, however, that people were already familiar with the use of sulphur in winemaking since Cato, even though the original text on the matter has been lost. It was customary at the time to ferment both red and white wine in contact with the skins in order to obtain an intense colour (Pliny). For this procedure, however, the grapes had to be healthy. The vogue for clearer white wine was lost during this period in favour of wine with more intense colouration. Another technique used in the preservation of wines was reduction by evaporation. (At between 17° C and 18°C yeast loses its fermentability and the wine retains its sweetness). The Romans even spoke of different types of reduction. There were four types of wine: sapa (reduced to one‑third, according to Pliny the Elder); defrutum, which according to Columella in his “Agricultura”, Vol. XII, involved boiling until reduced to half the original volume and allowing it to age for a period of one year; caroenum, a reduction to two‑thirds of original volume (according to Palldius); and, finally, the passum, a dessert wine of Phoenician origin made from raisins (according to Columella). This method of preservation served to improve quality, and although cheaper, was an inferior technique to that of “diachiton”, or straw wine, which incidentally took place at the same winery as an alternative to one of the methods described above. Another old technique (Bassermann, 1907: 562) was the apotheca vinera – horreum vinarium, or fuminarium, a reduction which involved putting good quality, heavy red wine in a special barrel over a drying furnace so that it acquired a smoky tone. Columella went on to describe other ways to use defrutum, in which the addition of seawater or salt plays an important role. It was common to add aromatic herbs. These wines were usually drunk mixed with water. The knowledge of tapping yeast was essential to prevent the wine from spoiling. Cloths – saccus vinarius – were used to filter the wine. To remedy the problem of poor quality or cloudy wines, finely chipped charcoal, egg white, ox blood, milk, fish glue “ictiocola” (isinglass) or gum Arabic was used as fining agents.Pliny (Pliny, XIV, pp. 20, 24) suggested another technique, which was to “referment” lacklustre wine by blending it with fresh must. Seed and dried berry fossils of Vitis vinifera have been found in Portugal dating back to this period (Silva 1988, 16). One pioneer in this research was a prominent figure (Silva, ibid. ), one Brother Manuel do Cenáculo [Villas Boas] (1724 ‑† 1814), of the Ordem Terceira de S. Francisco. Confessor to the Crown, member of the Royal Academy of Sciences of Lisbon, Bishop of Beja and Archbishop of Évora. He was a pedagogue and reformer, historian and cultural source of inspiration, founder of libraries, as well as a patron of Arab and archaeological studies in Portugal. Of interest here is the reference he made to discoveries in Roxo (Alvalade, Santiago do Cacém), of “dried grape berries” (Silva, ibid.). Barros (1994) describes 50 different Roman wineries (apotheca); and Santos Banha (1994) classified the most diverse types of amphora, from examples found at Sellium and Tomar; the countless fragments of amphorae (dolia) provide ample justification for identifying these locations as Roman wine‑ making facilities. In fact, the Romans substantially influenced the Iberian wine industry of the time both in terms of grapevine varieties and technological progress, with the introduction of the screw press, and different amphorae for the fermentation, transport and storage of wine. 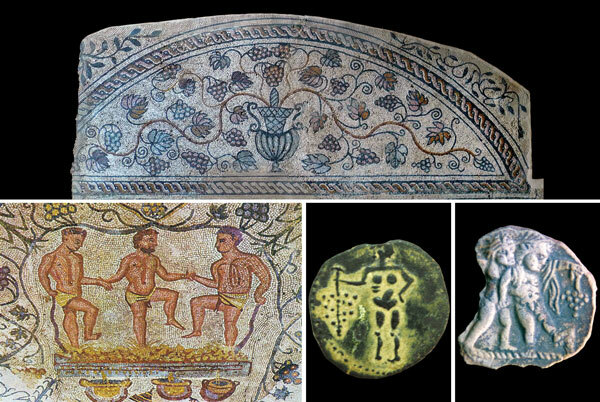 Mosaics depicting Bacchantes and amphorae were discovered at Torre da Palma (Monforte, Alentejo), Conímbriga and Mérida (Fig. 44). 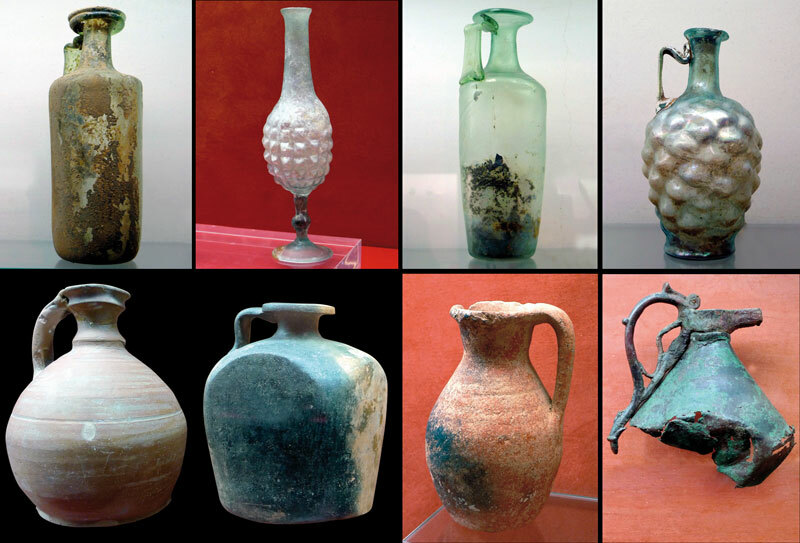 There is little or no documentation before the Romans on the use of flasks made of glass to store wine. Since the Romans, however, its use in luxury items was common (Fig. 45). 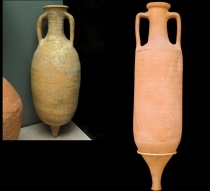 Johnson (1999:85) comments, “The idea of wine bottles may have originated with the Egyptians, but they came to Portugal with the Romans.” Other storage containers used included clay amphorae, and ceramic containers of various sizes, which would have been sealed with wax. Wooden barrels were also used. Extremadura. The capital city Emerita Augusta (Merida) was a major supplier of agricultural products to the Empire. The vast plains of the Guadiana River Basin guaranteed irrigation during the heat and in dry periods.This is how we come to have several Roman mosaics and sculptures relating to viticulture which hail from Merida, the provincial capital of Lusitania. They are housed in the Museo Nacional de Arte Romano [National Museum of Roman Art] in Merida (Spain). 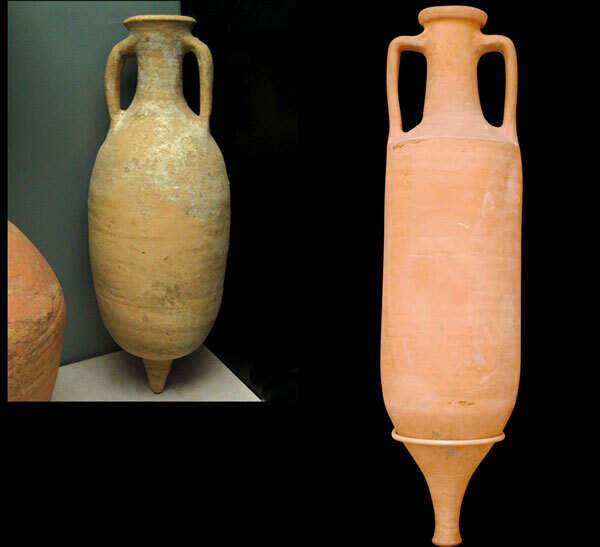 One hundred amphorae probably of Greek origin from the sixth century BC were found in Badajoz (Ofrenda de la Capilla no 6 de Concho Roana [Zalemea de la Serena]). 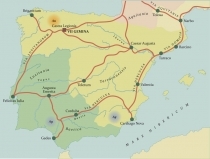 Merida later became an important Roman centre, with Emerita Augusta being one of the first places to embark upon large‑scale vineyard activity. Important fossils from the second century AD were found in a Roman‑Lusitanian well in Idanha‑a‑Velha (Portugal), a significant settlement during this period. 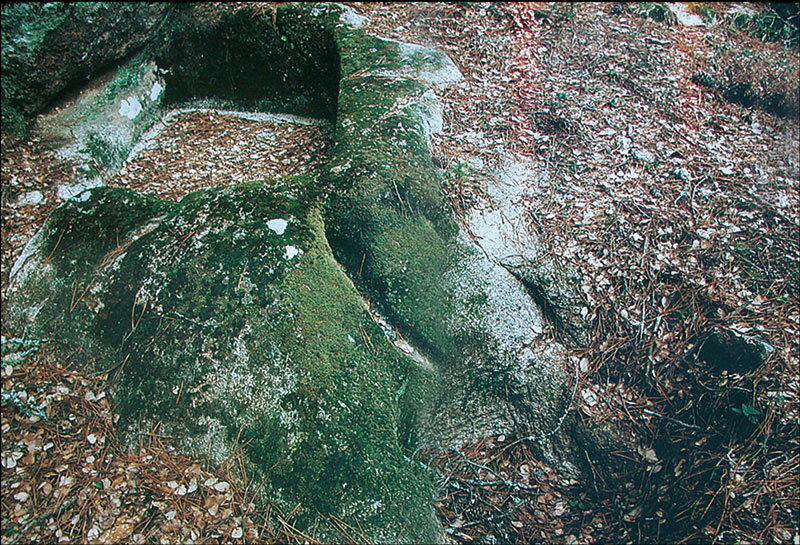 This discovery is the subject of a paper by Fernando de Almeida and Octávio da Veiga Ferreira, 1967, which examined the via romana [Roman road] between Emeritas (Merida) and Augusta (Braga). Wine was very important, as was vinegar. Numerous clay amphorae with wine and vinegar residues were found at a port located at the estuary of the Sado River in Herdade da Barrosinha, near Alcácer do Sal. 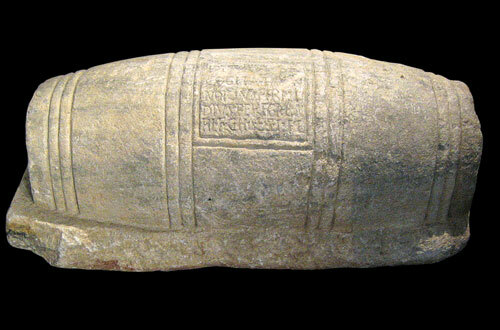 In addition to being used as storage, these clay containers were used to transport, and even export, wine. Fig. 35: After the expulsion of the Phoenicians, the Romans conquered the Iberian Peninsula, which they divided into the provinces of Hispania Ulterior (Lusitania) and Hispania Citerior (Tarraconensis). Fig. 36: Roman wine press from the fourth century, from the Douro region. Fig. 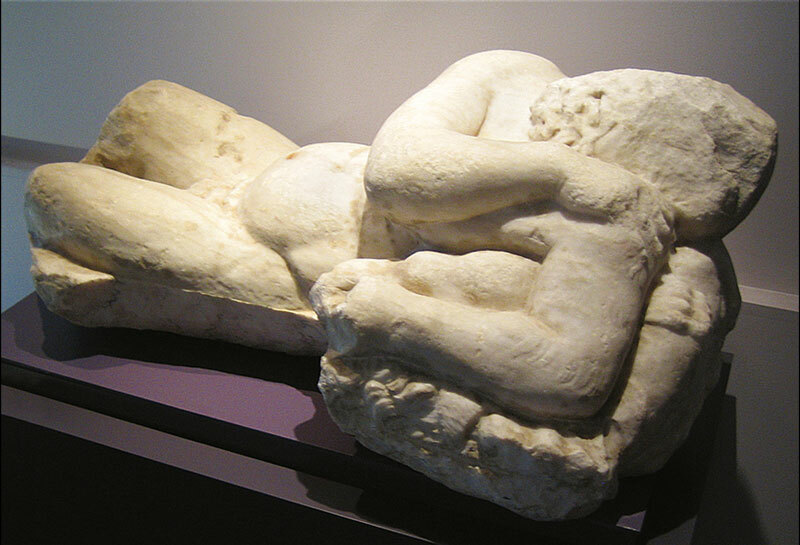 37: Sleeping Silenus, originally from the Roman Theatre of Caldas, Lisbon, first century AD. (National Archaeology Museum in Lisbon [Museu Nacional de Arqueologia]). Fig. 38 a, b: Side view and front view with wine press motif, first century AD, found at Reguengos de Monsaraz, Portugal. (National Archaeology Museum in Lisbon). Fig. 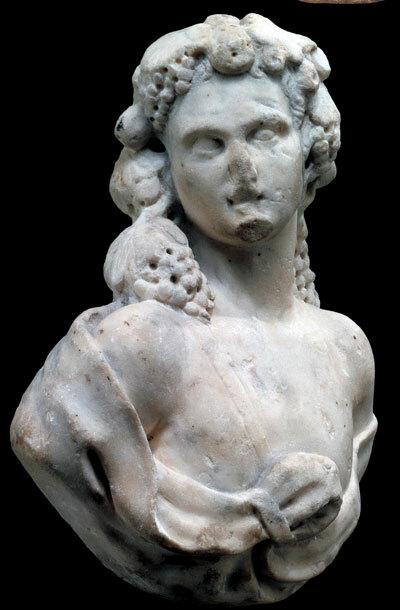 39: Bust of Dionysus, white marble, Roman, second-century AD. (National Archaeology Museum in Lisbon). Fig. 40: Stone sculpture from the first century AD in the shape of a barrel found in Mértola, in the Alentejo, on the Guadiana River. According to Claudio Torres such stones were used in burial rituals. Fig. 41: Clay amphora from the (Museo Nacional de Arte Romano [National Museum of Roman Art]), Mérida, Spain, and the (Museu Nacional de Arte Antiga [National Museum of Ancient Art], Lisbon, Portugal). Fig. 42: Iberia under Emperor Diocletian, AD 289. Fig. 43 a, b: Mosaics from Mérida and Roman coins (O. Rubio collection). Fig. 44: Roman marble relief of a tavern from (Augusta) Mérida, the capital city of the province of Lusitania. (Museo Nacional de Arte Romano [National Museum of Roman Art], Mérida, Spain). Fig. 45: Roman wine vessels. (Museo Nacional de Arte Romano).